Russell Wortley encountered Beatrice Hill nee Bishop in 1956/7 at Bromsberrow Heath, a village in Gloucestershire but with an address outside the County because of the location of the nearest Postal Sorting Office. 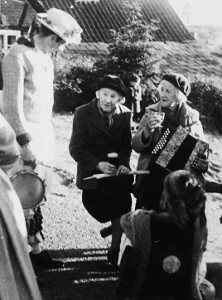 Beatrice Hill’s father, who came originally from Gloucester, kept the Bell public house in Bromsberrow Heath and was the Morris “King”. 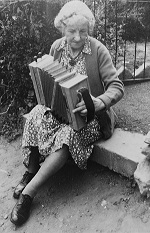 Beatrice was a melodeon player and played Russell Wortley A Nutting We Will Go, Down The Middle, The Girl With the Blue Dress On, Jack Robinson, Nelly’s Tune, The Three-Handed Reel and an untitled tune now known widely as Beatrice Hill’s Three Handed Reel. She also sang Annie Lee, Lansdown Fair, Little Pigs, The Londonderry Air, Lord Lovel and Maggie. Flowing, The Little Room, Lord Lovel, No Sir No, Northamptonshire Poacher, Raggle Taggle Gypsies-O, Riding in the Railway Train and Seventeen Come Sunday. She can be heard singing and talking about the Morris Dancing on Country Songs and Carols (Folktrax FTX-129). Russell Wortley’s recordings of Beatrice Hill and Emily Bishop are available for listening, by appointment, at the British Library, 96 Euston Road, London NW1 2DB. 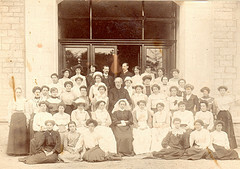 See www.bl.uk/collections/sound-archive/cat. Peter Kennedy also recorded three of Beatrice Hill’s tunes when he was working for the BBC, Herefordshire Breakdown, Nelly’s Tune and A Nutting We Will Go. He also recorded Emily Bishop singing The Angel Gabriel, A Fountain of Christ’s Blood, The Line To Heaven, On Christmas Night All Christians Sing, The Moon Shines Bright, A Virgin Unspotted and Wassail Song He issued them on Folktracks 45-115, A Nutting We will Go. Mrs Hill played for Peter Kennedy in F. If she played the same melodeon for Russell Wortley, the tunes he recorded were probably in F and C, not G and D as transcribed here. In 1980 Gwilym Davies took Mike Yates to visit Beatrice’s son, Ivor Hill, in Bromsberrow Heath when he sang TheHolly and The the Ivy and List Our Merry Carol. Beatrice and Emily’s grandfather, Thomas Bishop, was born in Leigh, Worcestershire in 1799. He married Mary Reynolds from Taynton, Gloucestershire, in 1847 in the Newent registration district and by 1851 Thomas was described in the Census as a’ labourer pauper’ and they were living in Ryton, Dymock Ryland, with their son, Thomas, born in 1848, Beatrice and Emily’s father. Also living with them were Joseph and Edwin ’Randals’ aged 11 and 8 – probably ‘Reynolds’ from a previous marriage of Mary’s. By 1861 they were still living in the same village where Thomas was an agricultural labourer. They had two further children living at home, Mary Ann, born about 1853, and James, born about 1855, both born in Dymock. Thomas died in 1863 in the Gloucester registration district. By 1861 their son, Thomas, had left home and was living in Ketford, Dymock Ryland, as a servant and agricultural labourer in the house of James Young, a farm bailiff. In 1869 he married Fanny Poole from Chosen (Hill), Gloucester, in the Newent registration district. 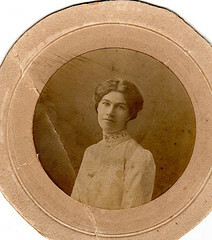 Fanny already had at least one daughter, Ellen, born 1868, and by 1871 they were living in Bromsberrow Heath with two children, Mary A. born about 1867 and Ellen born 1868. Living in the same house were Mary, Thomas’ mother and his siblings Mary A. a ‘late housemaid’ and James, an agricultural labourer. Emily was born to Thomas and Fanny in early 1879 in Bromsberrow Heath but by 1881 the family had moved to Ryton, Dymock with further children, Annie born about 1871, Henry born about 1873, Alan born about 1878 and Alice born about 1879. Thomas’ mother, Mary, was still living with them, working as a laundress, as was Thomas’ stepdaughter, Ellen Pool(e). Beatrice Fanny Bishop was born in 1881 but her mother, Fanny died in 1884. Thomas remarried in 1885, to Mary Gittings, who already had at least one son, Thomas A. Gittings, born in Ledbury, Herefordshire about 1881.Thomas Gittings is believed to have emigrated to the USA and was buried in the Lloyd Cemetery in Ebensburg, Cambria County, Pennsylvania in 1952.Thomas Bishop continued to live in Ryton with his new wife, Mary and by 1891 they were living there with his children, Alice L., Emily and Beatrice, and her daughter, Mary Gittings. 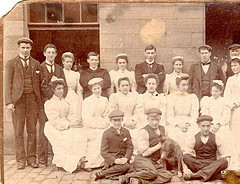 Thomas’ wife, Mary, died in 1893 and by 1901 he was still living in a cottage in Ryton with his daughters Anne, a housemaid (domestic) and Alice L. He was still there in 1911 with his daughters, Annie who was a housekeeper and Emily who had moved back home and was a housemaid. Beatrice had left home by 1901 and was working as a housemaid at The Mead, Cirencester (next to the Vicarage) in the household of Wilfred J. Cripps, a barrister and expert on antique plate from an old Cirencester wool family. In 1907 she married Frederick Hill, a labourer and seventh child of Hiram & Ann Hill from Bromsberrow. Shortly afterwards in the same year she had a son, Vivian Allan Hill. Vivian Hill probably married Florence E R Pike in 1946 in the Gloucester Rural registration district and died in 1988 in Gloucester. In 1911 Beatrice and Frederick were living at Rock Cottage, Ryton, Dymock and had another son, Ivor, born about 1909. A family tree on Ancestry.com also refers to a further son, Carroll Hill who died in 2001. In 1922 Beatrice and Frederick had a daughter, Frances Thelma M. Hill. Beatrice Hill died 19 February 1963 in Gloucester Royal Hospital. Her address then was given as Homestead, Bromsberrow Heath, near Ledbury. Probate was given to Vivian Alan Hill, a cemetery worker. Beatrice’s daughter, Thelma, married Douglas G. Hill in 1946 in the Gloucester Rural registration district. She died 8 December 2012 in Bromsberrow. Douglas G. Hill died in Gloucestershire on 8 December 2003.
had left home by 1901 when she was probably working as a housemaid at the Nordrach-sur-Mendip TB Hospital in Somerset. By 1911 she had moved back home with her father in Ryton and was working as a housemaid. She never married and died in 1961 in Bromsberrow Heath, now in Herefordshire. nstable Bishop’s collar number is 505 ‘B’ which would indicate he would have been patrolling the Chelsea District of London and could have been attached to either Gerald Road, Kensington or Walton Street Police stations. The armband denotes that the officer is ‘on duty’. In the 1911 census he was living in Canada and fought with a Canadian Regiment in the Great War.